I set up my loom yesterday to weave a narrow band – just 28 ends. Once I had made my simple heddles, tied them in a bunch and added the shed loop I realized that my entire loom consisted of just two simple sticks – the two loom bars and that’s all – one attached to a bed and the other to me. My weft was tied in a butterfly – no sticks there. The only other stick involved was a wooden beater to prop open my sheds and beat in the weft. How much simpler can it get? So, again I ask you, how much simpler can it get? Actually it can get simpler! 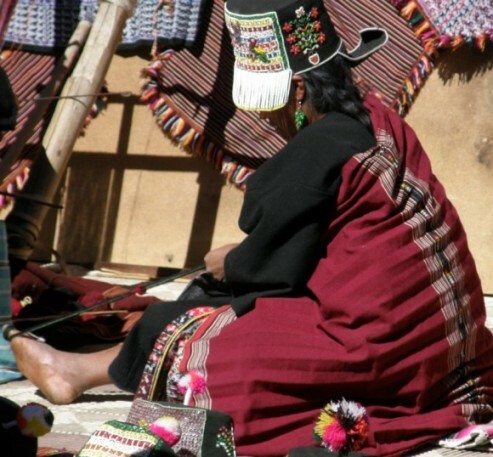 I was in Tarabuco recently and watched a weaver sitting on the ground deftly wind a warp around her hand and foot. She tied one end of the warp around her foot, passed a length of yarn through the end loops at the other end and secured it to her waist. Then she made simple heddles around her hand, added a shed loop and started to weave. Briiliant! All in a matter of minutes. You are probably thinking: okay, a simple loom for a simple weave– but even very complex weaves can be done on a very basic set-up. You may recognize Felicia above with her sleepy cat from the video in this previous post. She has a shed rod, a heddle stick and some bars between which to stretch her warp. She has just inserted a couple of thin sticks to help with the pick-up but look at the photo at left and see the complex designs that she creates on this simple set up. Now what about those looms that you see in pictures on the internet and in those Youtube videos? Some of them are loaded up with sticks – all those mysterious sticks – what in the world do they do? Hopefully I can solve the mystery behind at least some of them here. I have to admit that there are Asian looms that I have seen online with a multitude of patterning sticks and that I still haven’t figured out how some of those sticks work. LEFT: Your loom is set up with heddles and a shed rod. RIGHT: Open the shed rod shed, place your beater within and draw it down to the weaving line. Remove the shed rod. It is important that the beater not fall out at this stage as it is saving your shed rod shed. Use a back up safety string if necesary. LEFT:Open the heddle shed and place an additonal stick within. RIGHT: Tilt the beater to open the shed up beyond the heddles and place your original shed rod within. Tie or tape the shed rod and additional stick together.You have created your second cross. Another Guatemalan loom with a second cross installed. The shed rod is pvc pipe which is often used as it can be thick without being heavy. Notice the orange safety string – if disaster strikes (and it most probably will with those 3 little guys hanging about!) and all this weaver’s sticks fall out, the safety string will save her cross. Even the experts use them! Look at the little future weaver there on the left. She is wearing the typical long “corte” skirt and even has her own woven belt. Some looms have a mind boggling amount of sticks but the reason can be very simple!! 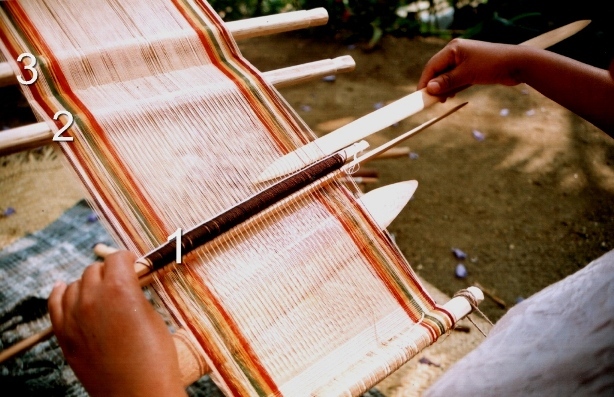 LEFT: The 11 sticks on this upright loom in Ecuador will become heddle sticks. The 22-row design, which is horizontally symmetrical, will be programmed into these 11 heddles. RIGHT: This is one of my own warps set up on my Navajo loom in Chile. As I am using 4 colors in my pebble weave I have extra sticks to separate and keep the colors in order for the pick up. 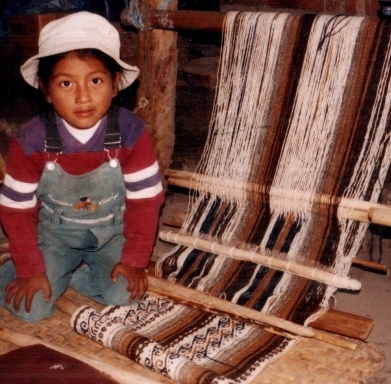 Miguel Andrango’s granddaughter poses with one of the looms. You can see the two shed rods above the heddle stick. The space for the extra shed rod is programmed into the warp by using an extra stake during the warping process. In Ecuador I saw the use of an extra stick which I have not noticed anywhere else. This is especially useful for wide warps or particularly fine yarns but I saw it being used on warps of all widths and yarn sizes in Ecuador. It is an extra shed rod. I know from my own experience that the shed-rod shed on a wide piece with fine yarns is really difficult to open. It was a very slow and tedious process on my Abba Yohanni piece, for example. The extra shed rod in Ecuador holds every second warp that passes over the main shed rod. This means that half the number of warps can be raised using the extra stick. Then it is very easy to use the main shed rod to raise the rest of the warps. This is one of Miguel Andrango’s looms. He is a very well known weaver from Agato, a small town near Otavalo. You can watch a video of his work here. Fifty-seven seconds into the video you will get a very nice close up of the two shed rods. You will also see the typical white woven alpargatas he is wearing. I spent some time with an alpargata weaver and hope to blog about that some time. Miguel Andrango is not a large man and, although the piece above is not particularly wide, he weaves some of the widest backstrap woven pieces I have ever seen! 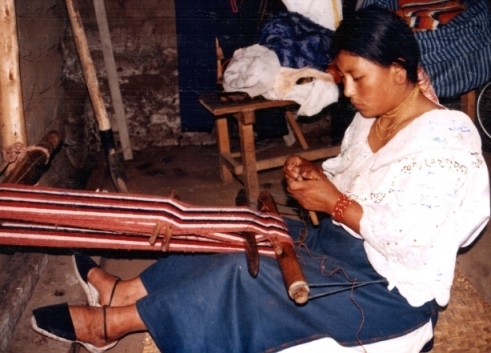 A weaver near Otavalo is preparing to make her string heddles. She is using the extra shed rod on her loom. This rod has a dual purpose as it also serves to stabilize the main shed rod. 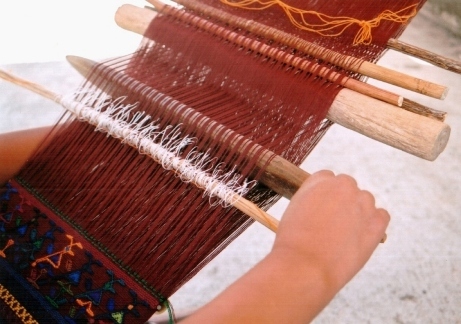 Now we come to the patterning sticks that are used by weavers in Guatemala to create designs using supplementary wefts. The supplementary wefts are either laid in to form block patterns or wrapped around warps to form little figures. It is not my intention here to teach you how to insert and use these sticks. So, don’t worry if you don’t quite get it. No doubt, I will be doing a tutorial on this in a future post. I just want to take a little bit of the mystery out of it so that when you are looking at weavers and looms in books and on the net you may have a better understanding of what all those sticks do. For now, read on and just enjoy the beautiful textiles!! 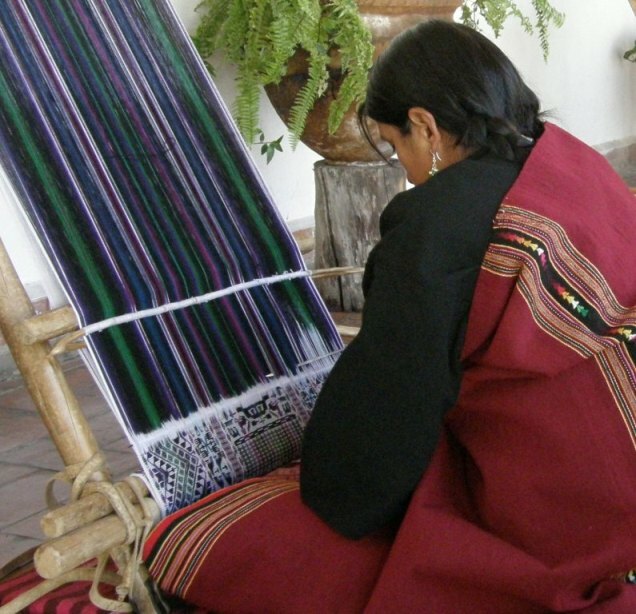 Typical designs of Santa Catarina Palopo.LEFT:Supplementary wefts have been laid in to make designs like the X’s in the center or wrapped around warps to form figures, like the stem of the plant below and the arms of the woman above. 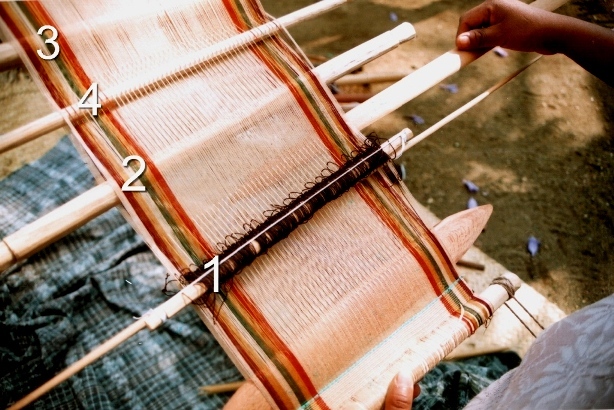 RIGHT: The upper design has been woven using the technique employed in making the typical huipil of this town. 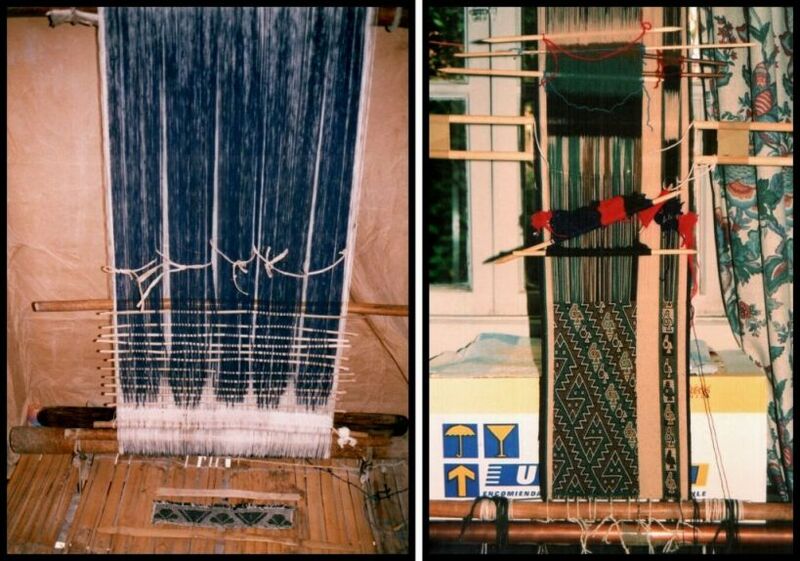 LEFT: Bands woven using patternig sticks and offered to toursits. RIGHT: The typical huipil of Santa Catarina Palopo. These colors are a relatively recent introduction. Old huipiles in crimson and white can be seen in paintings by Carmen Pettersen. My teacher told me that only the very oldest women in the town may still have the old huipiles. Carmelita is teaching me on this loom in Santa Catarina Barahona. Number 1 is her heddle stick, number 2 her shed rod, number 3 the stick in the 2nd cross and number 4 is her newly introduced patterning stick. 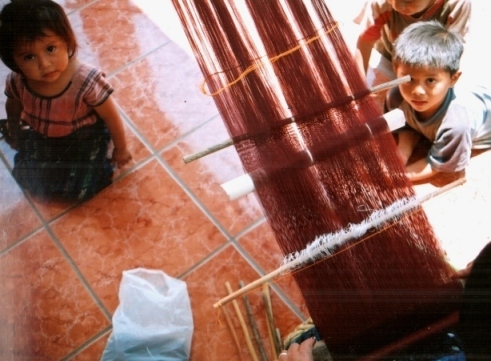 These patterns are created by adding two extra sticks to the loom – the patterning sticks. In Santa Catarina Barahona, the weavers open the shed-rod shed and pick up every fifth warp. They store these warps on a stick – the patterning stick that sits up behind the shed rod. The heddle shed is then opened and, once again every fifth warp is picked up but in such a way that each picked up warp sits between two that were picked up on the first patterning stick. The warps are stored on another patterning stick which sits behind the shed rod but, this time, under the warp. Here is how the loom looks with both patterning sticks installed. Number 1, heddle stick. Number 2, shed rod. Number 3, stick in 2nd cross. Number 4, 1st patterning stick and number 5 the 2nd patterning stick. 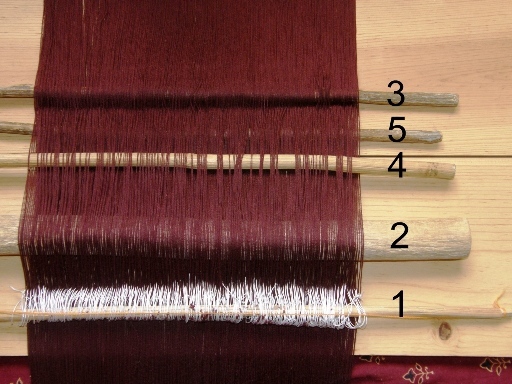 The patterning sticks are simply drawn down towards the heddles to create sheds for laying in the supplementary wefts. LEFT: Lydia is laying in a supplementary weft in one of the patterning sheds. RIGHT: The patterns at top and bottom were made with the aid of the two patterning sticks. Sometimes a second pair of patterning sticks is inserted when the weaver wants to change the design. These are only temporary and will have to be removed when she wants to return to the original design. Take a look at the photo below…can you name all the sticks?! 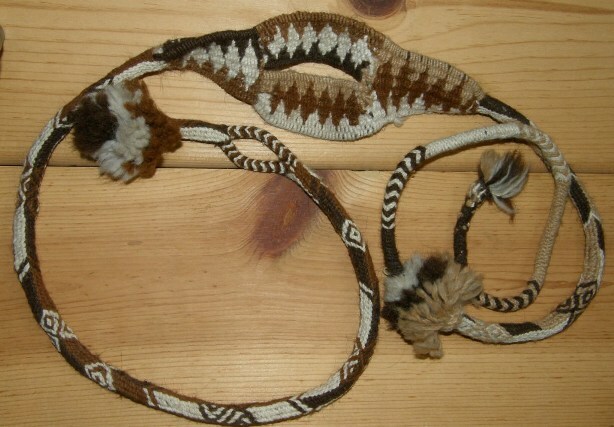 A sling braid made from llama fiber from the Colca Canyon area of Peru. It comprises a braid with a finger loop in one end and a cradle in which the stone to be hurled sits. Now to return to the simplicity with which I started this post…………some braiding and edging techniques with few or no tools required. After having done the tutorial on cross knit looping last week, I remembered another interesting edging that I learned with my sling braiding teacher in Yanque, Peru. We used it to edge the cradle section of an Andean sling braid. I made one sling with him and he taught me to make three different braids. Men in Peru braid their slings holding all the braid strands in their hands – no other equipment is required – and can quite happily stroll along the road while braiding. Two of the braids I learned had twenty-four strands and the other twelve. I was told that the main use of the slings these days is to hurl stones in order to keep control of animals straying from the herd. LEFT: The single cross two-color edging that I was taught on my sling. RIGHT: A double cross two-color edging on an Andean sling that I bought. 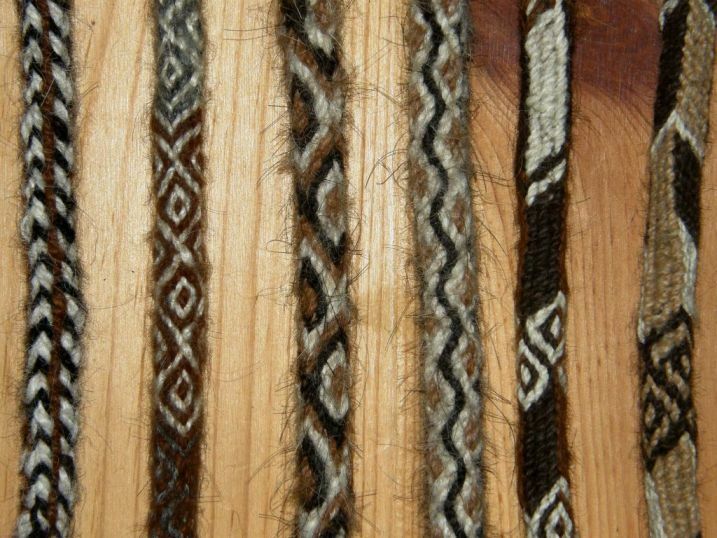 When making an Andean sling, first, one half the braid is made. The strands of llama fiber are measured from the tip of the nose to the toes and then doubled. The first section usually includes the finger loop. More strands are added to weave the cradle in tapestry technique and then work the braid for the other half. The cradle is woven on a backstrap set-up tying the braid to the waist while the strands which serve as warp are tied to a fixed point. 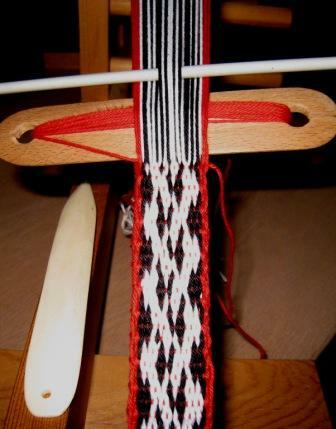 Then the second half is worked in two braids – first a thick one and then a thin one to finish. Decorative tassels and edgings are the last things to be put in place. Some of the tassels can be quite flamboyant. My teacher didn’t care at all for the more extravagant decorations! I love these slings as there are several skills involved. Without even realizing it, this was my very first taste of backstrap weaving and with this one teacher I learned so much. He taught me the Palma and Margarita braid styles and a thin version of the Palma which didn’t seem to have a name, a little tapestry weaving by backstrap as well as tassel making and decorative edging. LEFT; The very start of the Palma braid with the 4 sets of 6 strands used to make it. RIGHT: My hand in the braiding position. Two opposing sets of strands are interchanged. The braid is then rotated 90 degrees so the other two sets can be worked. Zacarias was a marvelous teacher with a lot of patience. He would get me started on my work and leave me while he harvested the barley crop – plans were afoot to make some alcohol – moved the animals from one field to another and generally took care of things on his property. LEFT: My sling braiding teacher, Zacarias on his property near Yanque, Peru. RIGHT: A woman by the shores of Lake Titicaca shows me how to hurl a stone with a sling braid. I know that backstrap weaving isn’t for everyone and I am so glad that people are still able to make use of the instructions here and at Weavolution and use the techniques and designs on other looms. 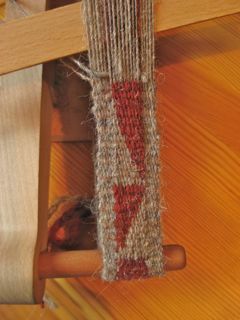 Ellen Turner, in Denmark, has woven a double weave band on her inkle loom using my tutorial at Weavolution. She made a celtic design inspired by something she saw on the internet. I also ran into Jessica’s blog where she has been experimenting with double weave on an inkle loom too. Check it out. 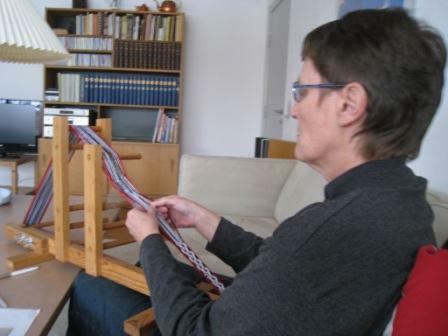 Kristina in Germany wove a double weave band on her inkle loom using her own handspun llama fiber. 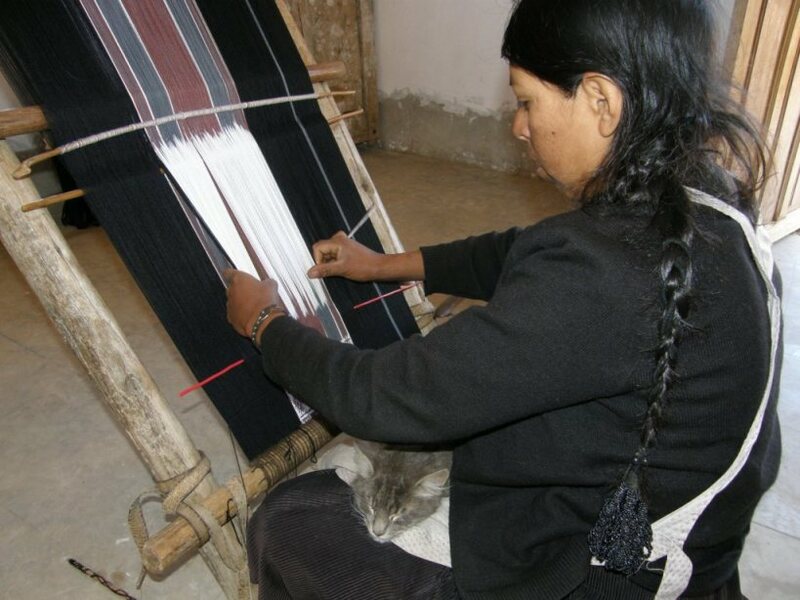 She commented that it put a lot of stress on her inkle loom so that is one important thing to take into consideration. So if you have been enjoying the designs and have found the tutorials interesting and tempting but are still hesitating about getting strapped in, remember that you can adapt these techniques to other looms. 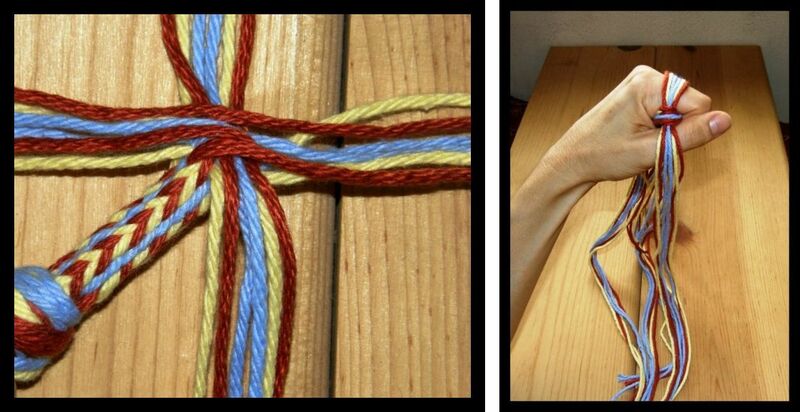 I have set up warps on my rigid heddle loom and woven bands with string heddles rather than with the rigid heddle. I have to tell you, though, that for me the backstrap loom wins hands down for the ease with which I can adjust tension with the slightest of body movements. And, finally, I mentioned above the paintings of Carmen Pettersen. 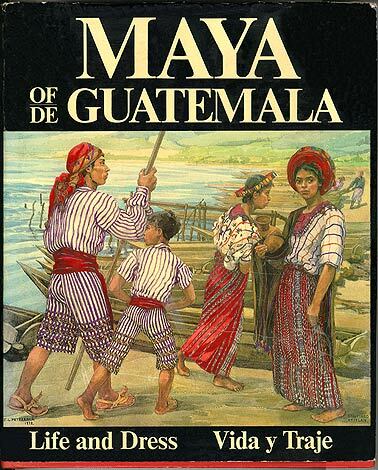 Check if your library has a copy of “Maya of Guatemala-Life and Dress”. Her paintings of Guatemalan people in traditional dress are stunning. « Backstrap weaving-cross knit looping tutorial and ikat. I have received the backstrap loom I ordered, and now am faced with, what to weave? I’m a weaver, but backstrap is new to me. Could you recommend a beginner’s project to help me get accustomed to the backstrap loom and this method of weaving? Thank you for all the information and help you are giving on this website!!! These items are so beautiful! I love the colors! You could start out with something as simple as a key fob-something narrow and short to get the hang of things. Have you seen my article on WeaveZine? There is a link on the sidebar of the blog. That gives instructions for warping up and weaving a narrow sample band. Good first projects are key fobs, bookmarks or even a narrow long strap that could be used as the strap for a bag, belts. Slightly wider pieces can make cell phone pouches, pencil cases, coin purses. Are you a member of Weavolution? There are lots of ideas there. The extra shed rods seen in Asian backstrap weaving may well be pattern sticks, as they seem to work in rotation, and they all progress in turn down towards the weaver, the one for the shed just used is repositioned at the back of the warp before the next shed is opened. It certainly looks very complicated! Thank you for all the wonderful photographs, and explaining things so clearly! Thanks Caroline! I was wondering if they were patterning sticks and if, like in Guatemala, there are only two in operation at any one time which are then removed so the ones behind can be used. The confusion comes when you see them and think that they are all being used at the same time. Quite an array of designs can be made using just two patterning sticks. I need to watch more videos of the Asian weavers at work. Gracias de nuevo por un blog de tanta calidad!!! Te sigo leyendo, besos desde Argentina! great tutorial, makes the warping look realy easy (i obviously need much more practice). very envious of the peru trip, looked like great fun and sling braiding as well, now thats just the icing on the cake. I was thinking of you when I got the sling braids out. The easy warping is just a matter of getting a nice sturdy board made and doing it all in one fluid action so the tension stays even. it was the getting it off again where i had the trouble (went everywhere, had to rope the parents in to hold the other end). though not having the nack of the tenshioning bit may have not helped. Great Jess, I am glad to hear that it is all slowly coming together! I have a braiding tutorial for you next week. Just can’t tell you enough how enjoyable and educational your blog and Weavolution sites are…Thank you again and again! My biggest warping board allows me to make a warp of 36″. I use this for shoulder bags, wall hangings, table runners, sets of three mug rugs. This is the one in the video. I have a smaller one that makes warps of 25″ which I use for small bags and purses, placemats, hotpads. And of course the mini for keyfobs, bookmarks and coin purses. I am so glad that you are enjoying the blog. Thanks for your feedback! I have been asked about these braids by other readers and will be doing a video tutorial on the palma braid shortly. After that will come the margarita. There are books on this subject: Sling Braids of the Andes by Adele Cahander-a bit on the dense side. There is also Roderick Owen’s book which is much easier to follow IMHO. Maybe wait for my video and then see if you woud like to get the books after. Many years ago three or four long bands using Egon Hansen’s book. The bands in that photo are acrtually about 6″ wide. I imagine you are looking for something narrower, more like braid. Let me know what kind of width you have in mind and then I can see if I know someone who can help.